Each theme includes social media buttons that are designed specifically for that theme. These buttons appear either in the upper right of the theme or in the footer. 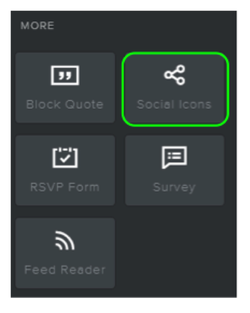 The icons can also be added anywhere else on the site by using the Social Icons element found under the More category of elements. They can be used to link to a Facebook fan page or profile, a Twitter feed, Google+, Pinterest, and many other services. 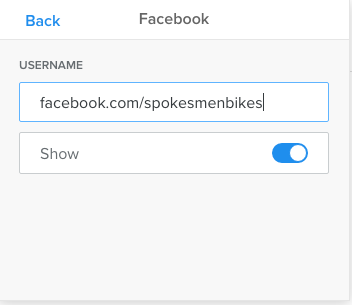 To add the social media icons in any section of a page, drag the Social Media element directly onto the page. Select which one you want to use, then either type or copy / paste a link to the appropriate page on Facebook, Twitter, etc. Or toggle off the Show button to hide this icon from your page. Activate any additional icons by scrolling down and selecting the service you wish to add. NOTE: To add the following custom icons, please contact Multimedia Services. We will need to upload them directly to your site: ResearchGate, LabRoots, GoogleScholar, Academia.edu, and Instagram. 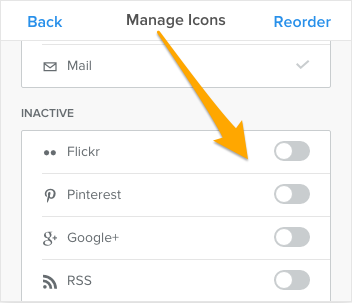 Click Reorder to change the order in which the icons are displayed by clicking and dragging up or down in the list. And that's all you need to do. These icons provide an easy way for site visitors to access your social media profiles and pages from any page of your site. You can add widgets and other content with the Embed Code Element.